What is unique about diving Gorontalo, Sulawesi? Not far from famous Sulawesi diving locations, such as Bunaken Marine Park, Lembeh Straits and the distant Togian Islands, is a hidden paradise . . .
Gorontalo lies along the northern coastline of Tomini Bay in northern Sulawesi, Indonesia. As you travel in our speed boat, gaze up the towering limestone cliffs that plunge directly into the sea. A narrow coral reef rims the coastline. To dive Gorontalo is a world-class experience. Have you ever looked across the equator? Ask us to show you how to see the curve of the earth! The continental wall of Sulawesi lies within a few meters of the shore. The first wall falls to about 30 meters where a short shelf is visible. Below is another vertical drop to 120 meters. Tomini Bay itself is over 4,000 meters deep. Deep ocean water comes right to shore. As a result, pelagic marine life passes near the wall. This includes schooling trevally, whales and whale sharks. Watch a whale shark video shot in Gorontalo. Also, we see pods of Bottle-nosed and Risso’s dolphin. Please ask us to explain the difference. 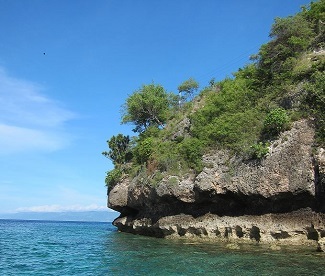 This coastline in Gorontalo is limestone from ancient reefs. The coral wall is highly eroded by natural forces. As a result, Gorontalo has some of the most fascinating underwater landscapes found anywhere. As you dive Gorontalo, notice that the wall itself is full of holes, fissures and caverns. In addition, pinnacles and muck basins are common. Long shore currents hit submerged points along the coral wall. This attracts schools of fish. The area of northern Sulawesi lies within the Coral Triangle. This includes Gorontalo. The marine environment here boasts the highest marine biodiversity on the planet. This area contains well over 500 species of stony, reef-building corals. In comparison, that is over ten times the number found in the entire Caribbean Ocean. 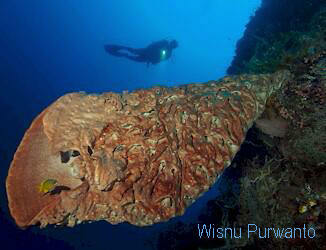 We guarantee that you will see surreal Salvador Dali sponges when you dive Gorontalo. They are a strange morphology of Petrosia lignosa. They are not found at famous Sulawesi diving destination near us – nor in other oceans. The delightful Blue belly blenny (Escenius caeruliventris 2004) is considered endemic to Gorontalo’s Tomini Bay. We know the few places where it lives. The list of new, undescribed or endemic species of marine life found in Gorontalo grows yearly. Many are found in our underwater photo book Gorontalo: Hidden Paradise (2006). 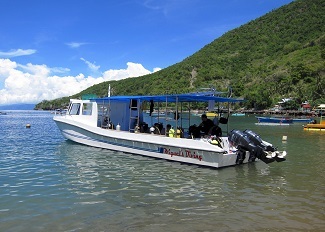 If you are an experienced diver looking for a new location, you will be pleased with the diving here. The gentle waters make diving Gorontalo appropriate for new divers as well. Let Gorontalo’s pioneer dive operator show you the marine life and locations we have discovered since opening diving here in 2003. What Does Miguel’s Diving Offer You? Our business model is based on ecological sustainability and community development. To sail and dive Gorontalo waters requires experience of the area’s micro environments. So, we train Gorontalo fishermen as dive staff. You benefit from their local knowledge. Gorontalo weather patterns are different from other Sulawesi diving locations. So, we prefer to pick you up for diving about 0730 hours. On a three dive day, we typically return to the dock by about 1600 hours. On those days, we provide a local rice lunch. Please let us know about any food issues. Also, please ask us about arranging a check-out dive on the afternoon you arrive. Regular diving season lasts from November to April. We take you to our private dock where two custom-built speed boats await. We reach the first cluster of dive sites within 15 minutes. The farthest we travel is about one hour from the dock. Olele Village Marine Park is about 30 minutes away. We helped the local community to create this marine reserve. We also worked with local government and World Wildlife Foundation to create the new Botubarani Whale Shark Reserve. Please contact us about the possibility to dive Gorontalo during off season. How Can You Travel to Gorontalo for an Excellent Sulawesi Diving trip? You can reach Gorontalo by air. International travelers can fly to Jakarta, Denpasar (Bali), Manado or Makassar (Ujung Pandang). Then you take a domestic flight to Gorontalo. We even have a new airport! Multiple flights are available daily. The overland route from Manado takes a full day whether by private transport or by bus. Please contact us directly to determine current flight choices into Gorontalo. 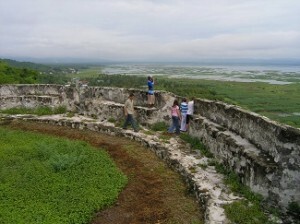 Popular day tripping around Gorontalo City includes a visit to Benteng Otanaha. It is a cluster of 16th century Portuguese forts. They overlook Lake Limboto. You can also take a dip in Lombongo hot springs after a hike to a waterfall in the jungle. Rise early for a morning trip to the fish market. Travelers with more time can travel to the north coast. There are quiet, white sand beaches. You will need to hire a driver and car. We provide you with the only tourist map of Gorontalo City available. We update it annually. It includes our tips on finding the hidden treasures of Gorontalo and our recommendations for eating. Please ask us about the local specialty, sate tuna! Where Can You Stay while You Dive Gorontalo? All accommodation is located in Gorontalo City. It is town that acts like an overgrown village with its friendly residents. Watch the free range chickens and goats. Take a ride on a wacky motorized rickshaw. We called them bentors. Gorontalo was not bombed during World War II. Hence, many Dutch era buildings are still in use. But in the mix are the conveniences of modern life. ATMs, cell phone service and Internet are widely available. Even more surprising is the new mall, compete with a cinema that shows international and Indonesian films. We can recommend simple accommodation for budget travelers who wish to save money for more Sulawesi diving. For inquiries or bookings, please contact us directly. For information in English or Indonesian, please call our cell phone. Staff are often at sea in the mornings. Gorontalo is in the same time zone as Singapore. If you have not received a reply within 24 hours, please resend your message.